Will Cliff, Lee Imiolek and Tom Brady have all signed new contracts with the Sale Sharks. 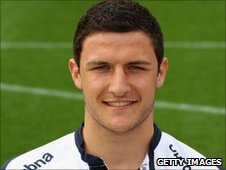 Scrum half Cliff, 22, and prop Imiolek, 20, have signed until 2013 while winger Brady, 20, has committed himself to the club until 2014. All three players are local to the club and have come through the academy. Chief executive Mick Hogan said: "This confirms that amidst the other signings we've made, we're glad to recognise the talent coming through the academy." "Will, Lee and Tom join James Gaskell, Henry Thomas, Iain Thornley, Will Addison and Rob Miller as the youthful core who will carry the club forward in the coming years," he added. Cliff made his Sharks debut in 2007 but has had to play understudy to Dwayne Peel and Richard Wigglesworth for most of his career. He managed 20 appearances last season, including twelve starts, and said: "I aim to continue making improvements to my game, and with the influx of new players at the club, life is going to be interesting!" Former England Under-20 international Imiolek made 24 appearances for the first team last season, and was also part of the Jets side which reached the Aviva 'A' League Final. "I was very pleased to sign, it didn't take much thinking about," Imiolek said. "We haven't had the smoothest of run-ins for the past two seasons, but under Steve Diamond and the structure he's putting in place, I'm sure things will be different." Winger Brady scored on his Premiership debut against Newcastle Falcons in September and despite two serious shoulder injuries, finished as the club's highest try-scorer. "My rehabilitation is progressing really well and I'm going to be stronger when I've recovered," he said. "I'm really looking forward to pre-season training. Even though Steve Diamond has a reputation for being a hard taskmaster, I'm ready to face some tough challenges."